Quay Quinn-Settel, the lead singer of Brooklyn-based Slowdance. The band is playing a free show on Monday, August 1 at the Empty Bottle. Photo from Slowdance's Facebook page. Quinn-Settel’s voice has often been compared to Blondie’s, although each time we hear the former’s voice in Slowdance’s “Sweetness,” we frequently find ourselves conjuring up images of Nena singing the opening verse of “99 Luft Balloons.” And we mean that with the utmost respect. From what we’ve heard, Slowdance’s sound is moody but not dark, full of synth beats and bass lines and anchored by Quinn-Settel’s vocals, which are soft but slightly haunting. Or you could just go by what she says of the band’s sound, which is, “If you mashup bits and pieces of our mentions at random, you might wind up with ‘ye-ye shoegaze crystalline buzz-pop.’ These words look great!” We can only hope some of the descriptors we’ve used about Slowdance end up in her next mashup. 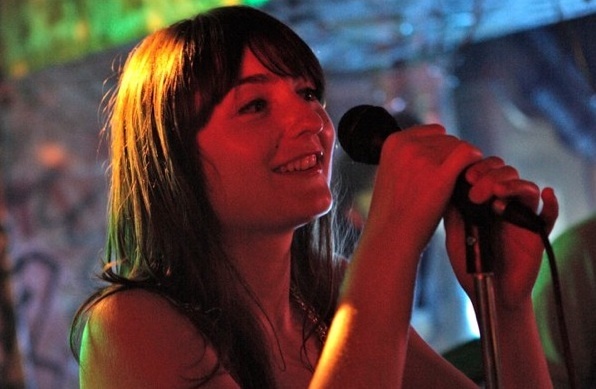 Like many female leads with dreamy bangs and an alluring voice, Quinn-Settel will induce copious crushes. But she points out her male bandmate, synth player Luke Fox, writes most of the lyrics. So to all future fanboys: she’s not singing about you. And at times, many won’t know what she’s singing about all, as she’s known to sing in French. Don’t worry, Quinn-Settel isn’t some indie-rock Parisian poseur. She was born in Santa Monica, Calif., but she attended grade school and middle school in Paris. Since Slowdance is beginning to get attention — they’ve been featured in Refinery 29, Stereogum and were deemed one of “8 Bands you Need to Hear” by L magazine — this is probably the last time Chicagoans can see them for free. By the time they tour again, Slowdance will likely have upgraded to staying in mediocre hotels, buying better fireworks and charging for tickets. But with any luck, Quinn-Settel will still be providing blithe albeit slightly bemusing answers to the questions of music writers. And she’ll still think of Chicago as a surreal vision of a kitchen from Maurice Sendak. But for now, enjoy them free of charge, an bon appetit. Slowdance plays a free show at the Empty Bottle (1035 N. Western Ave., Ukie Village) on Monday, August 1 at 9:oo pm. 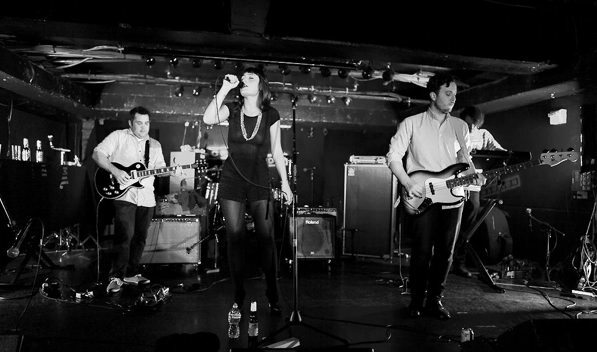 Slowdance performs during one their concerts in New York. Photo from Slowdance's Facebook page.